An ICv2 Release. 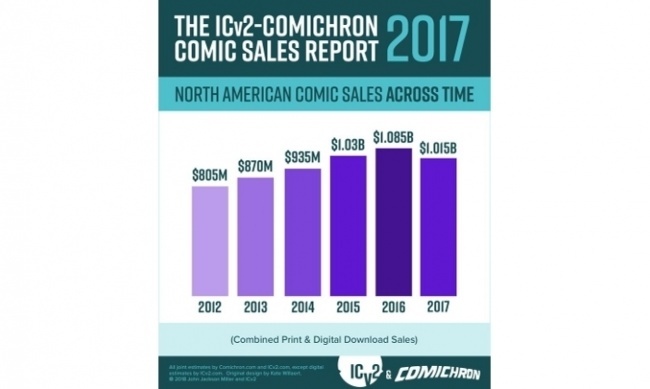 The comics and graphic novel market slipped 6.5% in 2017, with sharper declines in comic store and newsstand sales mitigated by stronger sales in the book channel and digital, according to a new joint estimate by ICv2’s Milton Griepp and Comichron’s John Jackson Miller. Total comics and graphic novel sales to consumers in the U.S. and Canada remained above $1 billion at $1.015 billion in 2017, a $70 million decrease from sales in 2016. "After a multiyear growth run, the comics shop market gave back some of its gains in 2017, with lackluster response to new periodical offerings and, consequently, graphic novel sales," Miller said. "The third quarter of 2017 saw the worst of the year-over-year declines, leading into what has turned out to be a stronger spring for stores in 2018." "While there was some softness to the market in 2017 (which we attribute to cyclical rather than secular change), there were positive signs," Griepp said. "The relative strength in the graphic novel and digital markets, especially the growing market for kids titles across print channels, bodes well for the future." As presented above and in the accompanying infographics, the analysis by Comichron and ICv2 was divided up between periodical comics (what some call "floppies" or "pamphlets"), graphic novels, and digital download-to-own sales. All print figures are calculated based on the full retail price of books sold into the market, and do not account for discounting or markup. Digital sales do not include subscription or "all you can read" services. This is the fifth joint market size analysis from ICv2 and Comichron; the first was for 2013 sales. See also, "ICv2 Releases 'Internal Correspondence' #94"
Click on the Gallery below to see the Comic Sales Report graphs for 2017. Comichron is the world's largest public repository of comic-book sales figures, featuring data from the 1930s to today about comic book and graphic novel circulation, cover prices, and market shares on its website, www.comichron.com. With data and analysis on the distant past as well as the present, Comichron serves as a trusted resource for academics studying the historical reach of the medium and for collectors seeking accurate information about how many copies of a comic book originally circulated.